This image of the STS-107 crew in orbit was recovered from wreckage inside an undeveloped film canister. The shirt color's indicate their mission shifts. 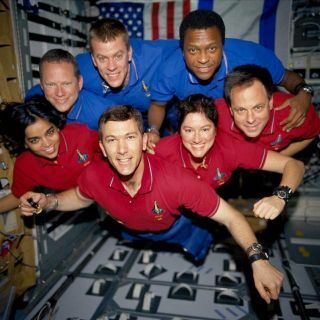 From left (bottom row): Kalpana Chawla, mission specialist; Rick Husband, commander; Laurel Clark, mission specialist; and Ilan Ramon, payload specialist. From left (top row) are astronauts David Brown, mission specialist; William McCool, pilot; and Michael Anderson, payload commander. Ramon represents the Israeli Space Agency.